To many people the Blower Door may seem like a new concept, however, they have been around for quite some time… close to 40 years in fact. The concept actually originated in Sweden1, but it wasn’t until it started being used for research applications that it took the form as we know it today—a blower door. From that early research it began to be adapted for use in Energy Audits and Retrofitting—giving birth to the “Blower Door Industry” by the mid-eighties. While other technology giants2 were also being born in garages across the country, these early developments led to the formation of over 10 different manufacturers that eventually consolidated down to three by the mid-nineties3. I wouldn’t be surprised if we are about to see that 80’s boom again as we are seeing more and more states across the country prioritizing and mandating air-sealing requirements. In the early days, part of the need for these blower doors was driven by being able to develop weatherization programs and to prioritize air-sealing requirements. Today it has become so much more than that, especially when you combine it with all the other tools and resources that are available4. Due to its much greater levels of accessibility and affordability, the blower door is being used by a much wider range of tradesmen and craftsmen—who are rapidly becoming the building envelope specialists that the construction industry needs. As an industry, we know a lot more, have data to back it up (decades worth actually) and continue to learn and grow—further refining our ability to understand the needs of our occupants. Groups like the American Society for Heating, Refrigeration and Air-Conditioning Engineers (ASHRAE) have even developed standards for defining appropriate leakage rates and even the comfort level of different spaces (ASHRAE Standard 55). Gaskets are a great solution to solving one of the greatest leaks of all–the top plate. Focus in high areas and in low areas of the building first because these are the areas that will generally yield the greatest impact when it comes to air-sealing5. Holes, cracks and penetrations are a top priority—anytime you put a hole exposing the inside to the outside of the building… it needs to be properly sealed up. Where different “things” come together, there is an opportunity for air leakage. Different things (like a foundation wall and a sill plate) don’t move or expand and contract at the same rate (yes our buildings are moving…). They definitely don’t provide the greatest seal by themselves either… this is why these areas are a critical part of any air-sealing strategy. Even though we have a good idea of where to seal, its easy to miss opportunities. This is where the value of Blower-Door Assisted Air Sealing comes into play. 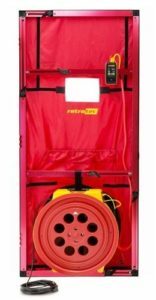 You can use your blower door to literally see how your air-sealing efforts are working and when you combine it with infrared imaging you really have a valuable “insulation tool kit” on your hands to help illustrate and visualize the value you are bringing your clients with your air-sealing work. Source: Building America report 1506, March 2015, K. Ueno and J. Lstiburek. With these tools, we’re able to identify cracks around windows and doors that must be effectively sealed. 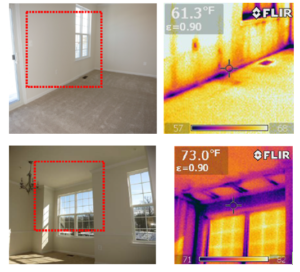 We can also provide a visualization of the thermal losses from the cracks and framing around the windows and doors. Now, more than ever, we are able to illustrate that affordable homes are built much tighter than this for little extra cost with profound improvements in energy bills, comfort and indoor air quality. But remember, the blower door is really only the first step in addressing the air-leakage in a home or building. That being said, it is a critical first step because it guides you on where to focus your efforts. Much like a GPS or navigation systems guides you to your destination, a Blower Door guides its user on where they need to put their time, effort and money to create the most cost-effective building envelope. Today we are seeing a rapid growth in development of different solutions to meet these needs—from specialty gasketing solutions to spray-applied sealants and even hybrid systems that incorporate a combination of multiple products and solutions6. So keep building that Insulation Tool Kit and continue to guide this industry forward. 4. Infrared Imaging combined with a blower door is visually very powerful because it can clearly illustrate where leakages occur in a building. 6. 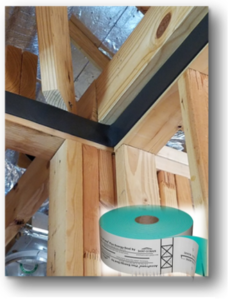 For more air-sealing strategies, be sure to check out our blog post Understanding Air-Sealing Strategies.